Almost seven per cent of corporate officers listed at the 100 largest public companies in Canada are women, up from 4.6 per cent the previous year, a study has found. The list, compiled by Rosenzweig and Company, an executive recruiting firm, and released Thursday, shows three women CEOs, up from one on the previous list. "There's cause for optimism,'' said Jay Rosenzweig, a managing partner of the firm. Thirty per cent of the companies studied had at least one woman represented on the list, up from 21 per cent last year. The three female chief executive officers on the list are Nancy Southern of ATCO/Canada Utilities, who was on the previous list as well, plus Kathy Bardswick of Co-Operators General Insurance and Linda Hasenfratz of Linamar. "There are studies that show a real positive correlation between diversity of a company's employees, both in terms of gender and ethnic origin, and company's business performance,'' he noted. Rosenzweig said flexible work arrangements are needed to accommodate women who want to work and have families. "There needs to be more work done, and it's beginning to happen, from the point of view of flexible work arrangements and policies that would really accommodate the needs of women to have and raise children while developing their careers,'' he said. 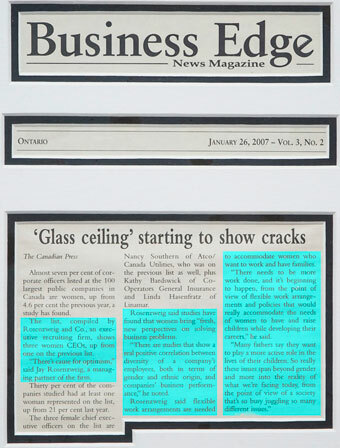 (c) 2007 The Canadian Press. All rights reserved.